The method presented here is adapted from a technique described by Ignatius Loyola in his Spiritual Exercises. St. Ignatius thought that the Examen was a gift that came directly from God, and that God wanted it to be shared as widely as possible. One of the few rules of prayer that Ignatius made for the Jesuit order was the requirement that Jesuits practice the Examen twice daily—at noon and at the end of the day. It’s a habit that Jesuits, and many other Christians, practice to this day. From the category archives of the dotMagis blog. 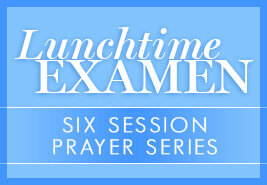 Pause to review your day in the presence of God with this six-session series led by Jim Manney, author of A Simple, Life-Changing Prayer: Discovering the Power of St. Ignatius Loyola’s Examen. Fr. Dennis Hamm, SJ, a scripture professor at Creighton University, calls the Daily Examen “rummaging for God.” He likens it to “going through a drawer full of stuff, feeling around, looking for something that you are sure must be there.” That’s an accurate description of what it’s like to pray the Daily Examen. We look back on the previous day, rummaging through the “stuff,” and finding God in it. We know he is there. A six-minute video about the Examen, produced by the Jesuits of the California Province. Simple and clear explanation of the Examen, focusing on what Ignatius intended when composing it. Audio presentation (with accompanying images) of the Examen as it is presented each day to the students at Strake Jesuit College Prep in Houston. Pray-as-You-Go, by the Jesuits in the UK, offers several helpful audio Examens. This follow-up video to “Examen” from St. Ignatius College Prep in San Francisco features a student trying out the Examen for himself. Several people think it is the best video they have seen about the Examen. 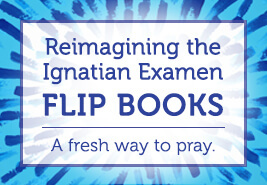 Pray with the nitty-gritty of your day with our Reimagining the Ignatian Examen Flip Books. Using prayers from the book by Mark E. Thibodeaux, SJ, the flip books bring the Examen to your desktop, laptop, or mobile device. This free app is based on Thibodeaux’s book, Reimagining the Ignatian Examen, which offers 34 adaptable versions of the Examen. An adaptation of the Ignatian Examen designed for managers. 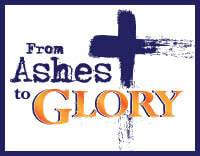 A way of praying the Examen through Lent, with materials by Joseph Tetlow, SJ. Take up the practice of reflecting on your day, its gifts and graces, and the progress you are making in life with Christ. Examen.me describes itself as a “modern approach to ancient devotional practices.” The site does not refer to Ignatius and, although its ownership is hard to trace, it is based in Fort Worth, TX. Examen.me offers six different types of examens, with only one being close to the traditional Ignatian version. This guide calls readers to take another look at the Examen through a consideration of the goal and shape of the prayer. It’s an abbreviation of an article by Aschenbrenner. The present format was prepared by Fr. John English and has been further amended by members of the British Province of the Society of Jesus. 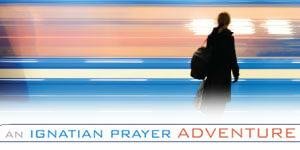 God is present in all things—even on the subway during the morning commute. A prayer card with the steps of the Examen as described by Jim Manney in A Simple, Life-Changing Prayer; available for online sharing or as a PDF download.